Canadians have reputation for not knowing their country’s history. 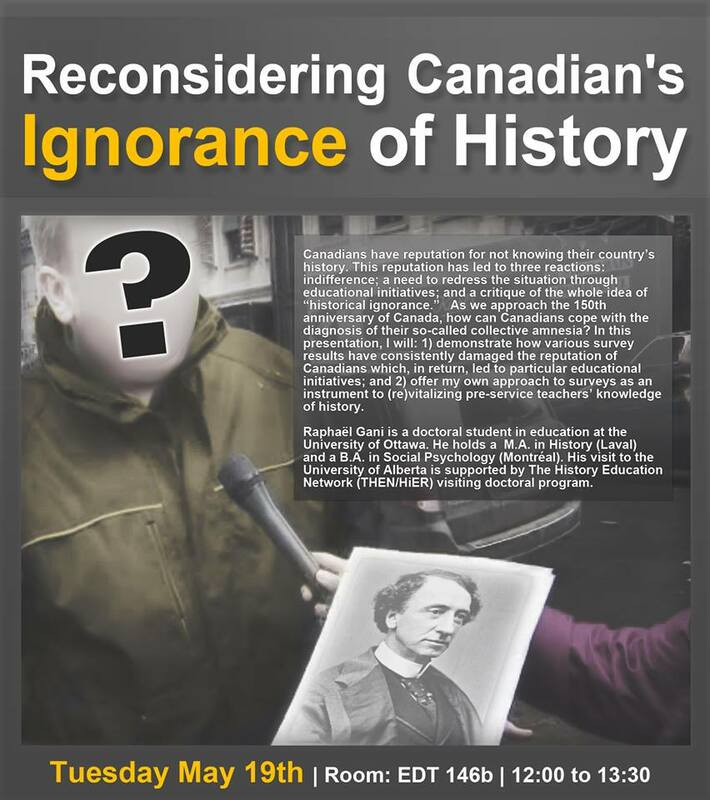 This reputation has led to three reactions: indifference; a need to redress the situation through education initiatives; and a critique of the whole idea of “historical ignorance.” As we approach the 150th anniversary of Canada, how can Canadians cope with the diagnosis of their so-called collective amnesia? In this presentation, I will: 1) demonstrate how various survey results have consistently damaged the reputation of Canadians which, in return, led to particular educational initiatives; and 2) offer my own approach to surveys as an instrument to (re)vitalizing pre-service teachers’ knowledge of history. Raphaël Gani is a doctoral student in education at the University of Ottawa. He holds a M.A. in History (Laval) and a B.A. in Social Psychology (Montréal). 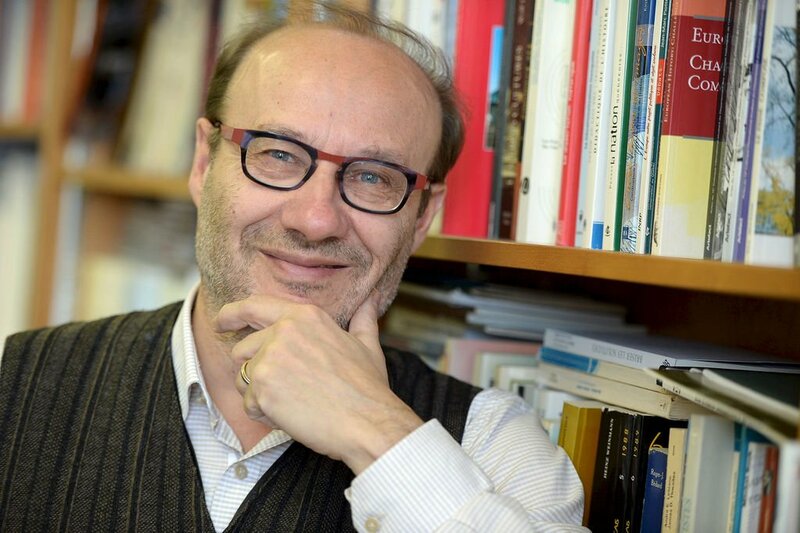 His visit to the University of Alberta is supported by The History Education Network (THEN/HiER) visiting doctoral program. 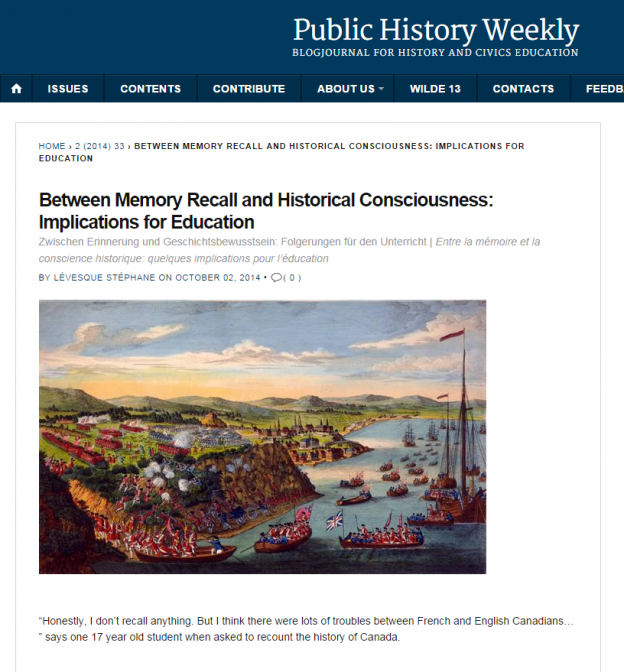 A blog post by Stéphane Lévesque about a research inspired by J. Létourneau’s work. “Honestly, I don’t recall anything. But I think there were lots of troubles between French and English Canadians… ” says one 17 year old student when asked to recount the history of Canada. Like many of her counterparts, Annie was initially baffled by the task of writing a historical narrative of Canada because, as she put it, “I don’t recall anything”. Public surveys periodically remind Canadians of the catastrophic state of historical knowledge among youth. “Canada is failing history,” as one newspaper even put it.